This is not your typical Stylish Retreat. It is a completely different kind of feature. If you enjoy college sports, you will appreciate this one!!! And if you don’t, you’ll still get to see something the public doesn’t typically get to see unless the coach says it’s OK! 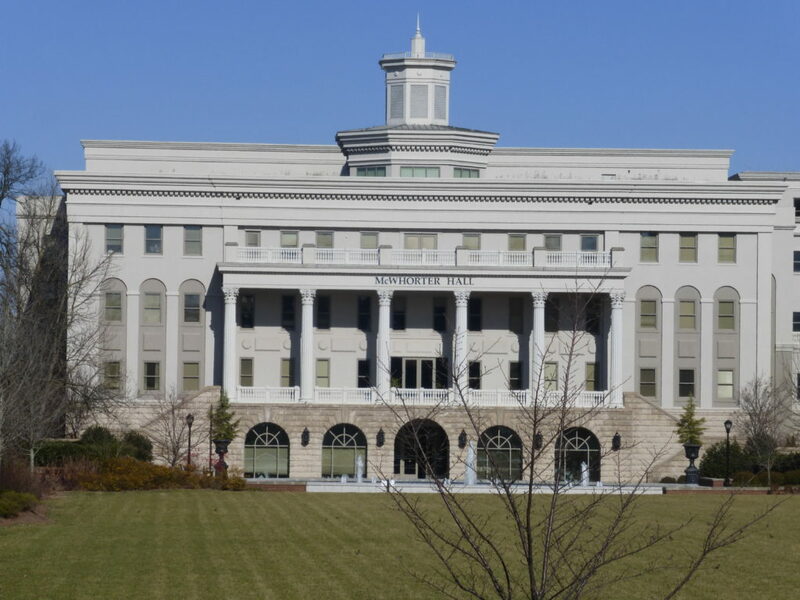 One of the crown jewels in the heart of Nashville is the beautiful campus of Belmont University. 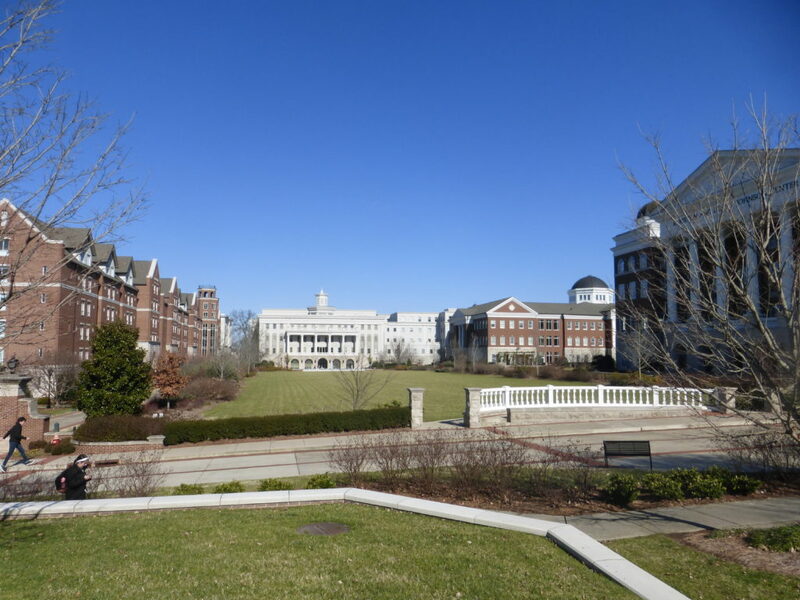 The architectural style at the liberal arts college is Greek Revival and Italianate. 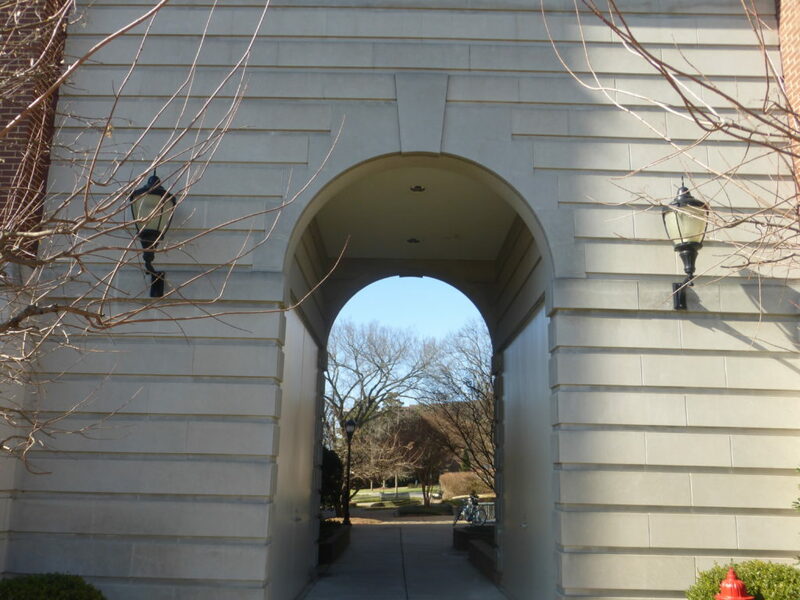 If you’ve followed my blog for awhile, you already know that I’m partial to arches and columns, so of course I’m attracted to the style of these buildings. 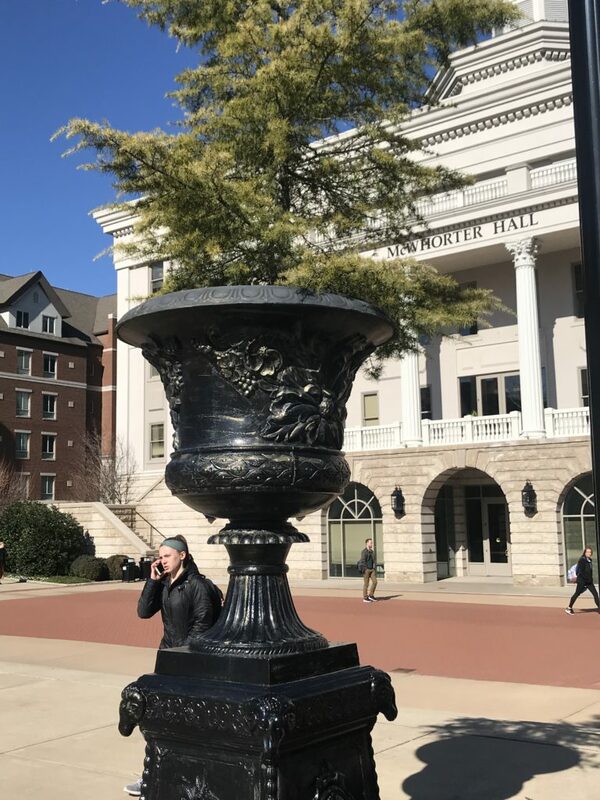 It’s the kind of intimate campus where you’re likely to bump into the head of the university like I did on this cold January day. 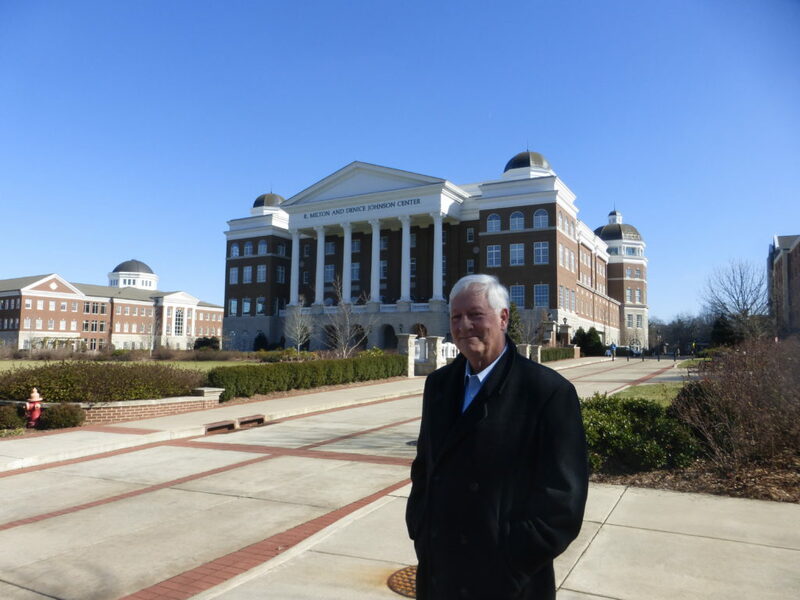 Dr. Robert “Bob” Fisher has been at the helm of the university since 2000 and has said quite simply, the Belmont culture reflects a “Belief in Something Greater.” That theme is one he’s said he hopes will encourage people to make it one of the great American universities for the next 125 years. 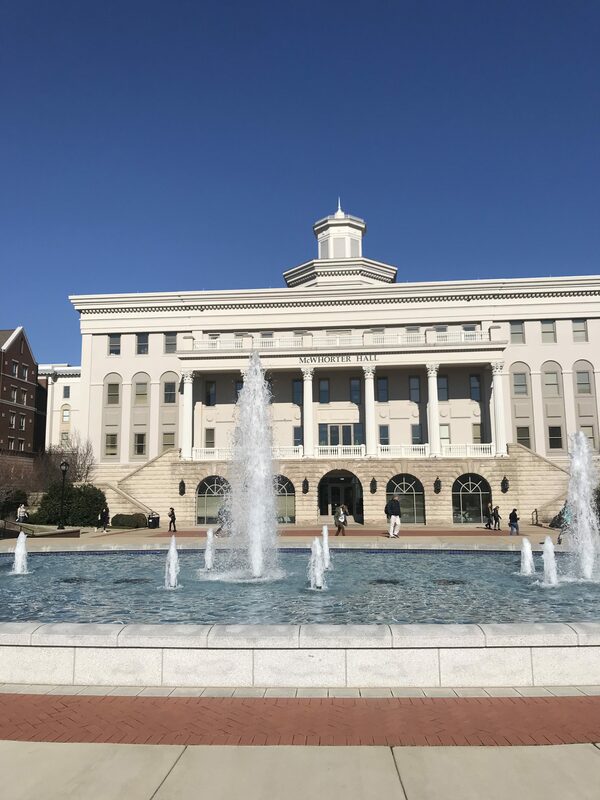 But I’m about to show you a part of campus that only a select few get to spend time in. 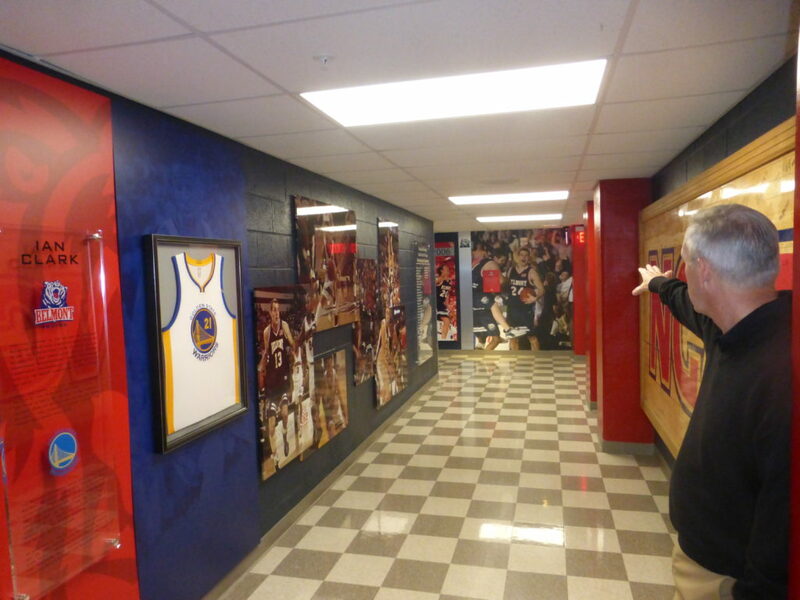 It’s where the men’s basketball team retreats in style, thanks to a recent renovation. And my guide, one of the all-time winningest Division One men’s basketball coaches, Rick Byrd. I got the chance to walk through the space before the Bruin’s practice one day last week with the well respected and winning coach to see where these athletes gear up and unwind before and after games and practices. 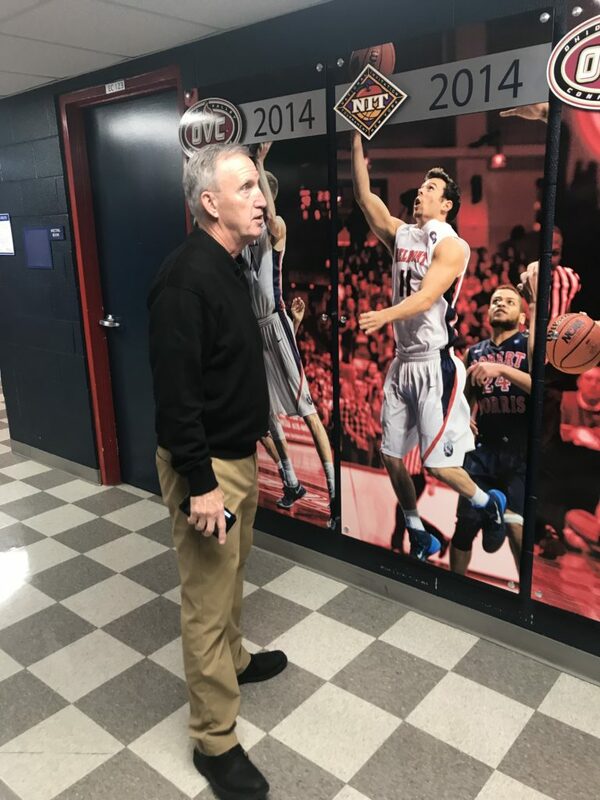 Here’s my interview with Coach Byrd, along with pictures in the Athletic Hall of Fame outside the locker room. 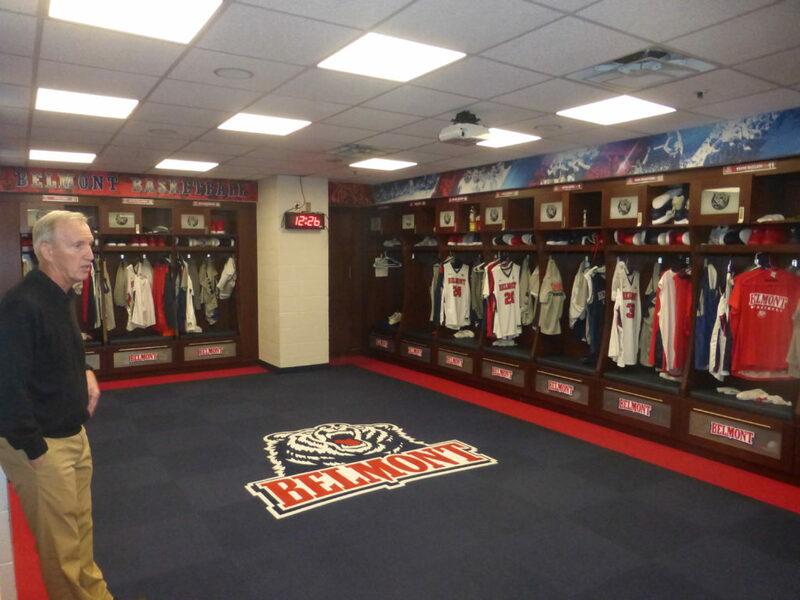 Why did you decide to renovate your locker room? What was the incentive, since the players and coaches are the only ones who see it? I’m guessing it really can improve morale? Coach Byrd: It had been nearly ten years since we had done really anything. The carpet was worn, the lockers were wood, but showing lots of wear and tear. Morale is a definite factor, and showing the locker room to recruits when they visit. 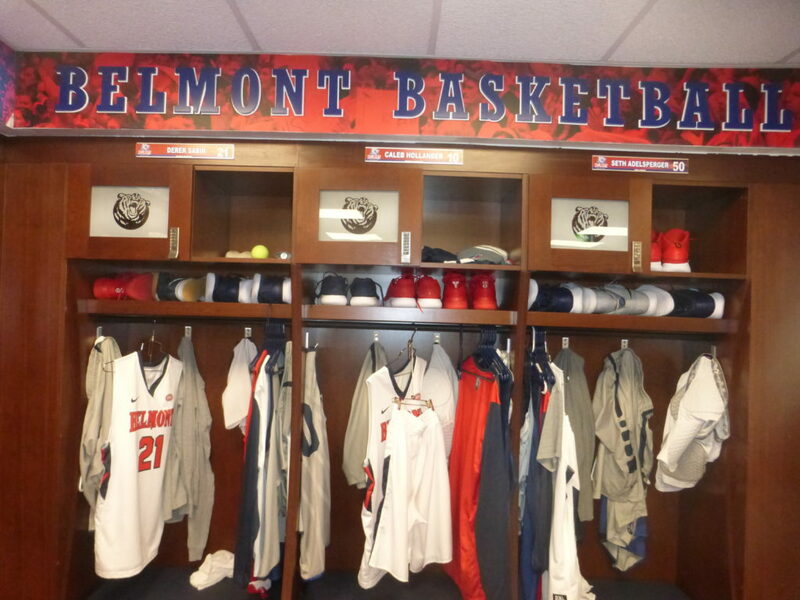 Doing things first class sends a signal to your team as well as those considering Belmont for their college career. What a colorful, clean, bright and well organized space for young college students!!! What were the considerations beyond function? Was it a look you were after or was it for comfort or for pride or all of the above? You said Advent did the design. Did they take your vision and make it a reality? Did they add things you hadn’t thought about? Coach Byrd: We tried to make our vision clear to Advent but certainly listened to their suggestions about how to make it look great. They are the pros, and their work was outstanding. I think all three things were important. 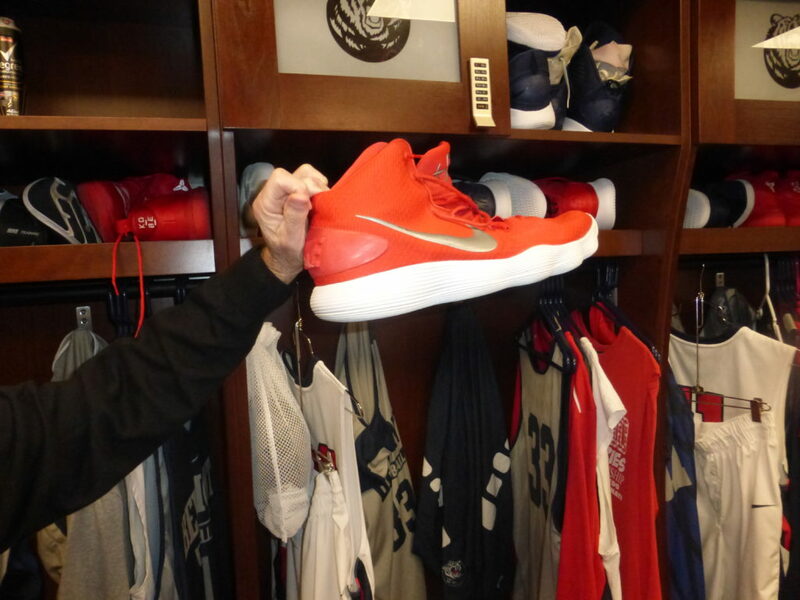 Functionality, comfort (it is kind of their home away from home) and a sense of the history of the program. 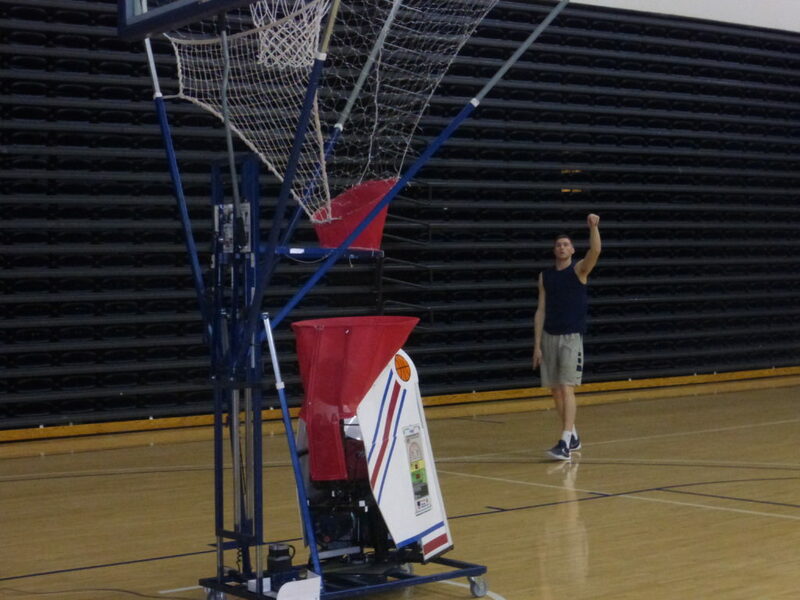 There’s Coach Byrd in the dark vest with a big smile on his face! What was the players’ reaction when it was finished? Coach Byrd: They had to stay outside of the locker room while it was being worked on, and they were certainly excited when they walked in and saw it for the first time. I think they have a lot of pride in it, and enjoy showing it to visitors, kids groups, etc. 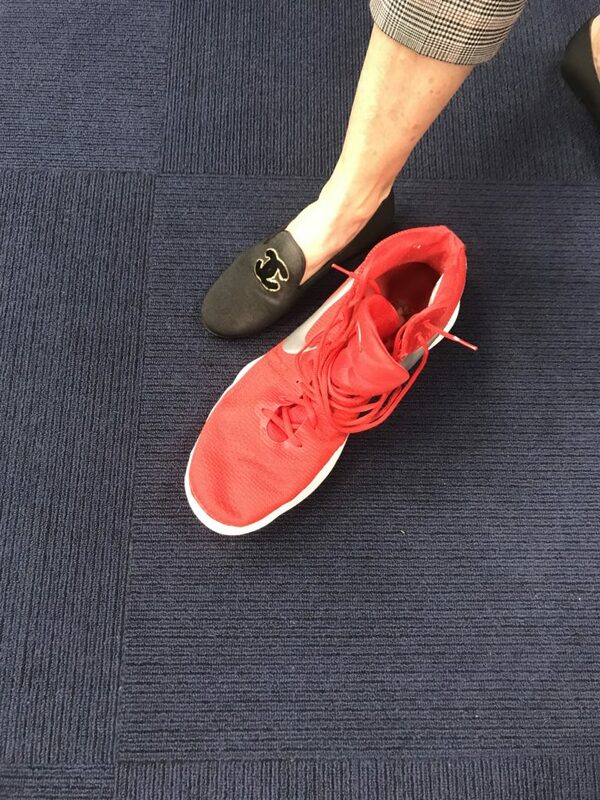 How about these shoes????????? You don’t realize how large they are when you’re watching the guys on the court! 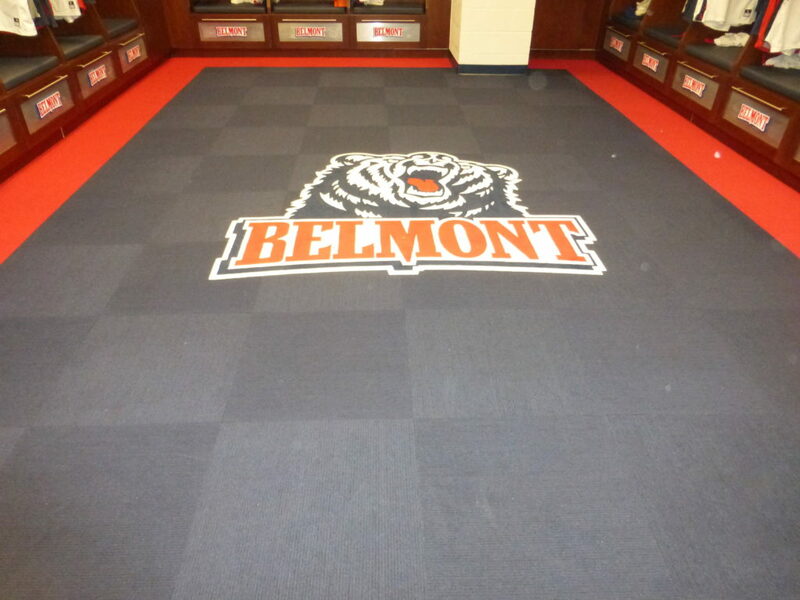 Tell me about the design or team logo on the locker room floor. Your players don’t walk on it?!? Coach Byrd: It is simply our athletic logo but our assistant coach Tyler Holloway thought it would be a good idea to make it a “thing” to not walk on the logo. The players liked the idea so it stuck! I love that. It really shows respect. 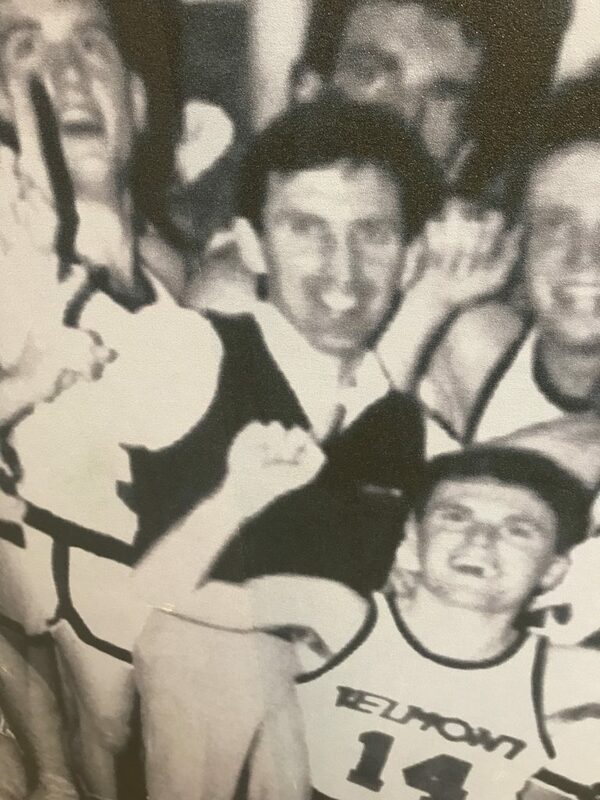 I know you mentioned having the Athletic Hall of Fame helps with recruiting but also has a cumulative effect on the current players as they see the photos and recognition given past and current players. What do the various pictures represent or mean to you and the team? 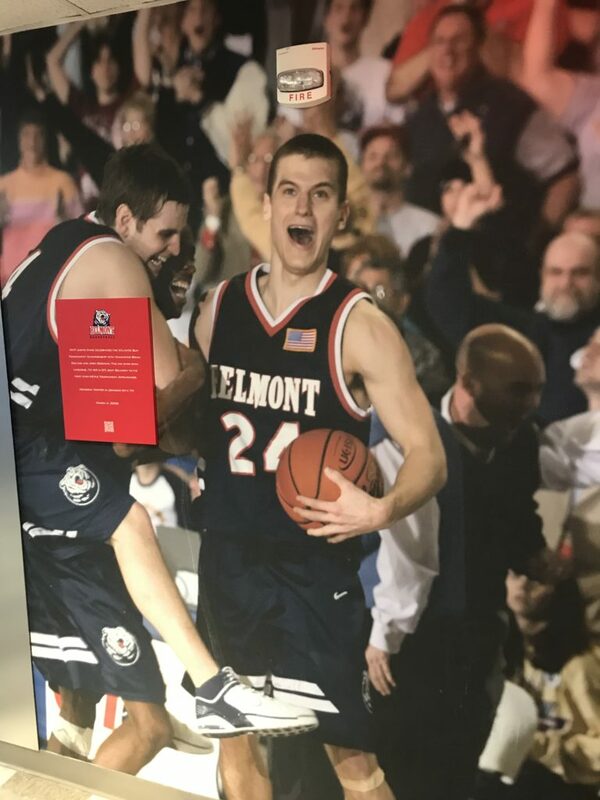 Coach Byrd: The entire hallway with the championship panels as well as the recognition of our players for their on and off the floor awards serves our program well in at least three different areas. 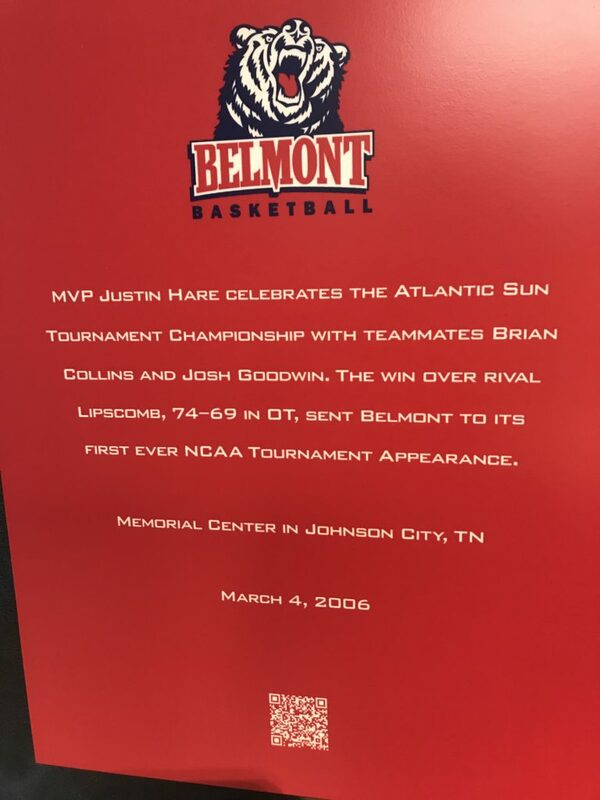 (1) It is a reminder for our players of the consistent success of our program and serves as motivation to continue that success. This panel has a QR reader that you hold your smart phone up to, and it plays audio of the moment this happened! Coach Byrd: (2) It tells that same story to recruits that visit our campus and see our facilities. 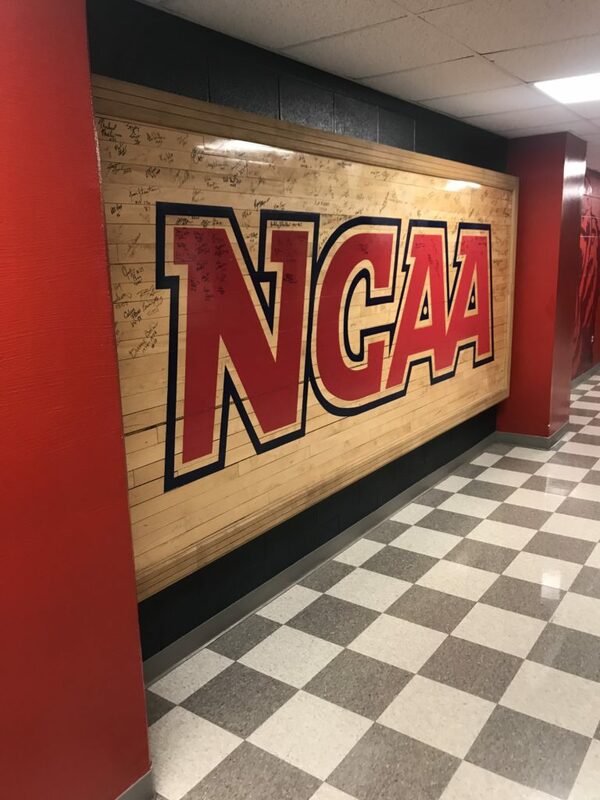 High school players want to play on a winning program with the chance to play in the NCAA tournament. 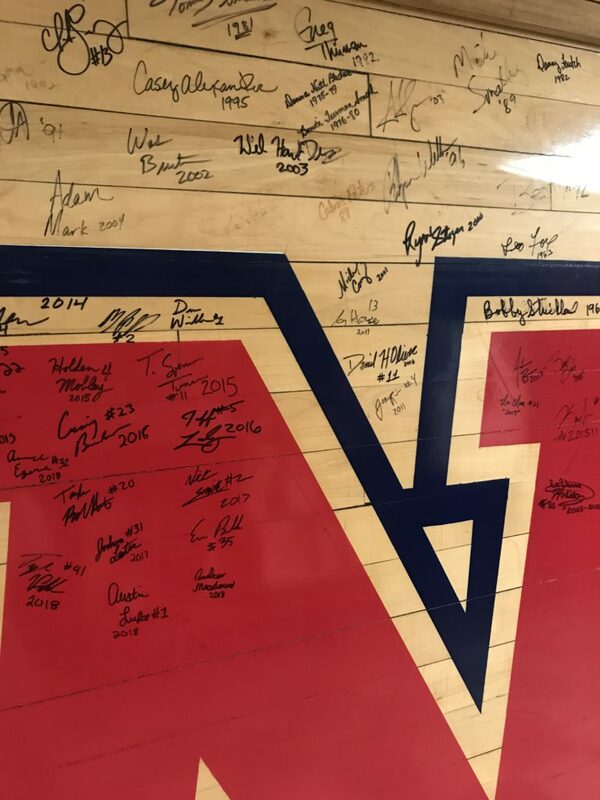 This panel is part of the basketball court from the former Striplin Gymnasium with player signatures. 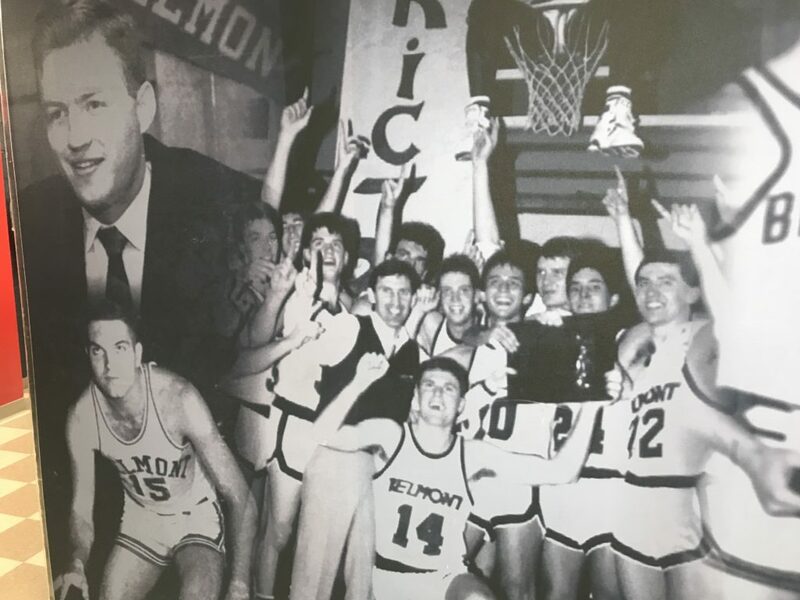 Coach Byrd: (3) It is a place where our former players can return and see the success of their teams and know that they are remembered and appreciated. These photos really capture the essence of the Bruins, their team spirit and must have a tremendous impact on them as they prepare for games. The pride they must feel as they walk down these halls each day!!! 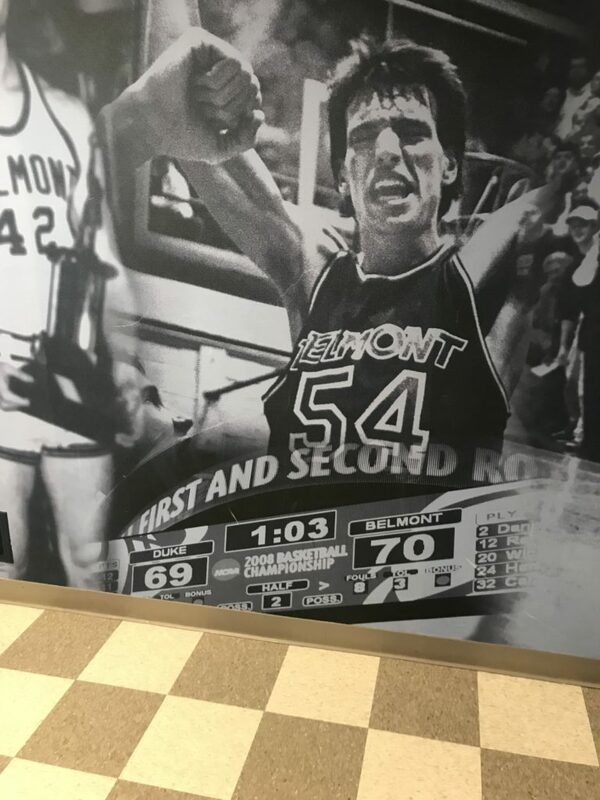 They’re clearly reaching for the top each time they take the court, led by a man who has achieved nearly 800 wins in his storied college coaching career, 33 of them at Belmont. Hoop dreams have come true many times for these athletes, including forward Dylan Windler practicing here, and it’s sure nice to see they can take their shoes off in style when the game is finished. Wonder what size those are anyway?!? 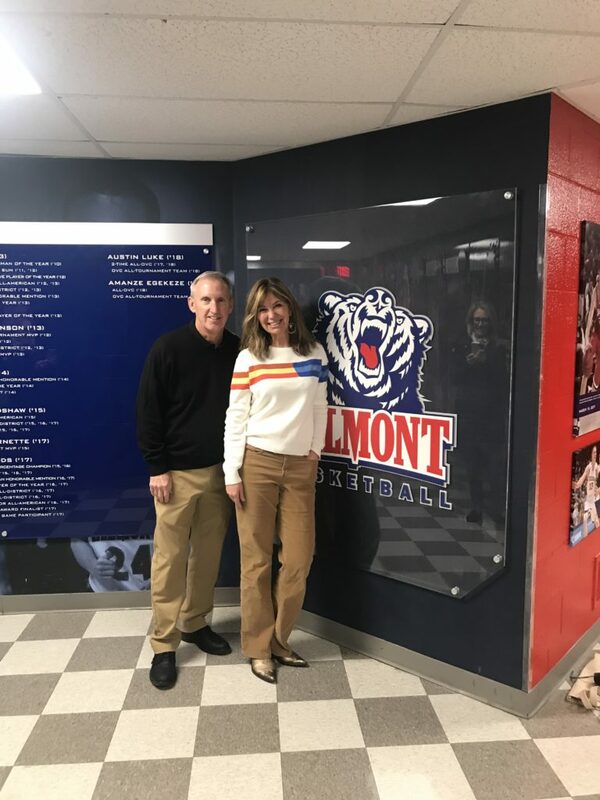 My sincere thanks to Coach Byrd and his wife Cheryl for putting this tour together for Stylish Retreats, and I appreciate my friend Beth Molteni for her support! Go Bruins!!!! !